“The deathly silence which began to reign as the Gestapo-men moved towards the gallows with the condemned was broken by the piercing cry of “mama!” which suddenly sounded from a window on the upper floor of one of the buildings in which we saw a child’s head. Before the passing of even one minute a little girl, maybe eight or ten years old, ran out from the building and rushed with a joyous cry “mama” to embrace her mother (Pozhar). My mother was a Zalkind the daughter of Abram and Anna (Kahn). Among other things they were the owners of the Zalkind department store. 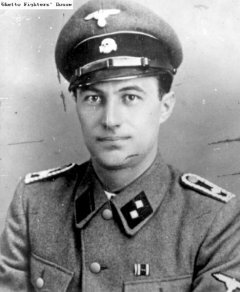 Abram Zalkind was the deputy diirector of the mercahnts union and was executed among the first 10 Jews that were executed upon the arrival of the Nazis. Anna was taken to prison and interrogated for a long period. Some survivors said she was executed in Ponar. Their son Michael, a medical student was killed (also as per survivors) while trying to escape from a transport train.